LONDON (AP) — The family of a British teenager who ran away to join the Islamic State group and now wants to return to the U.K. said Sunday she has given birth to a baby boy. The family's lawyer said 19-year-old Shamima Begum and the baby are in good health. In a recent interview with The Times newspaper, Begum said she had previously lost two babies to illness and malnutrition. News about Begum and her desire to go back to Britain have ignited a debate in the U.K. about how to deal with citizens who joined IS and want to leave Syria now that the extremist group is on the verge of collapse. 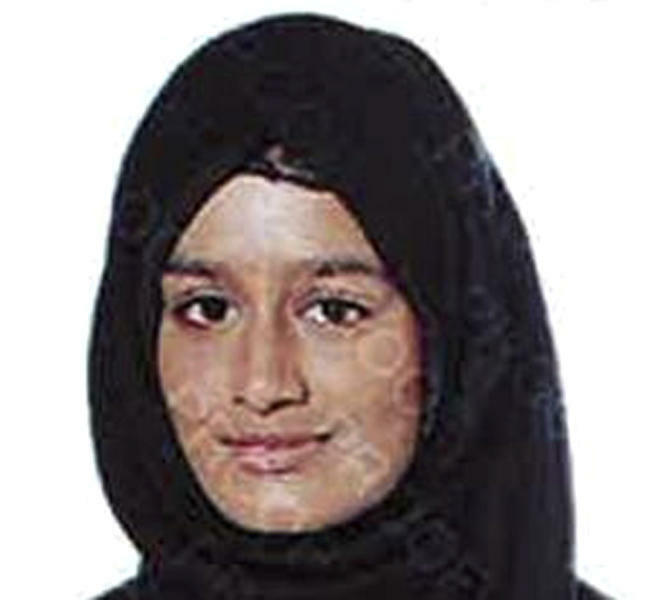 Begum was one of a group of schoolgirls from London's Bethnal Green neighborhood who went to Syria to marry IS fighters in 2015 at a time when the group's online recruitment program lured many impressionable young people to its self-proclaimed caliphate. Speaking to Britain's Sky News from Syria, where she has been living in a refugee camp, Begum said she didn't know what she was getting into when she left and wants to bring her baby back to Britain with her. "I think a lot of people should have sympathy towards me for everything I've been through," she said in an interview broadcast Sunday. "I just was hoping that maybe for me, for the sake of me and my child, they let me come back," the young woman said. "Because I can't live in this camp forever. It's not really possible." "I don't want to take care of my child in this camp because I'm afraid he might even die in this camp," she said. Begum said she had been only a "housewife" during her time with IS militants. "I never did anything dangerous. I never made propaganda. I never encouraged people to come to Syria. So they'd only have proof I didn't anything that is dangerous," she said. She added she had been "OK with" beheadings carried out by Islamic State adherents because she had heard it was allowed under Islamic law. While it is unclear whether Begum committed any crimes and her legal status is uncertain, it's possible Begum could face charges for supporting IS if she returns to Britain. Some people in her native country have focused on her apparent lack of remorse and argue she would be a security threat to Britain. Home Secretary Sajid Javid, who oversees immigration, wrote in the Sunday Times he would "not hesitate" to prevent the return of Britons who traveled abroad to join IS. "If you do manage to return, you should be ready to be questioned, investigated and potentially prosecuted," Javid said. Asked during the Sky interview if she felt she made a mistake going to Syria, Begum said: "In a way, yes. But I don't regret it because it's changed me as a person. It's made me stronger, tougher, you know." Two days before the baby's birth was announced, Begum's relatives in Britain said they were "shocked" by her comments but thought she should be brought back and dealt with by the British justice system. "The welfare of Shamima's unborn baby is of paramount concern to our family, and we will do everything within our power to protect that baby, who is entirely blameless in these events," the family had said. The family said it is concerned about Begum's mental health and characterizes her as having been groomed by Islamic State fighters.